For many people, fall means one thing. No, it’s not the changing of the leaves or the return of pumpkin-flavored everything – it’s football. And while many kids opt to play the sport itself, many others participate in the game from the sidelines. Cheerleading has evolved from a supportive extracurricular activity to a sport in its own right, mixing school spirit with advanced dance and gymnastics moves. Because of the difficult and risky nature of the sport, many cheerleaders sustain injuries during their careers. If you’re worried about your child getting hurt while cheering, use these tips to keep him or her safe this season. Because cheerleading has evolved at such a rapid pace over the past few decades, squads can’t simply be headed by an enthusiastic teacher or student anymore. Competitive cheerleading squads that want to perform the latest stunts and tricks need to be led buy a qualified professional. Before you allow your child to try out for the team, make sure he or she will be coached by someone certified by the American Association of Cheerleading Coaches and Administrators, recommended Kids Health. Instructors who have been vetted by this organization, or ones like it, are fully aware of safety regulations and have had years of experience in the sport. Once you’ve checked out the coach’s credentials, prepare a list of questions to discuss with him or her. Varsity.com recommended asking whether the coach plans to teach the squad all the necessary safety rules, and inquiring how he or she will ensure that this knowledge has been retained by the kids. For example, will there be regular safety quizzes or checkups to make sure everyone’s staying vigilant about safety? Additionally, ask the coach about his or her methods of teaching tricks. The source noted that skills progression training, meaning that cheerleaders are taught foundational techniques before being introduced to more advanced stunts, is ideal in terms of safety. If your potential coach doesn’t follow this method of instruction, be sure to get a detailed outline of how the children will be learning skills throughout the year. Lastly, ask about what the protocol will be in the event of an emergency. Even if your school has a solid plan in place, be sure to inquire about what would happen at an away game, competition or showcase. Make sure your cheerleader has a safe and healthy season. If your son or daughter is planning to try out for a cheerleading squad, he or she already has cheerleading, dance or gymnastic experience. While these skills might be enough to secure a spot on the squad, they likely won’t be sufficient to keep him or her safe and healthy all year long. Lehigh Valley Health Network explained that because cheerleading is a total body workout, and many squads adhere to high-intensity practice schedules, cheerleaders need to be vigilant about staying healthy off the mat as well. The source explained that kids should start working out regularly, focusing on strength training exercises so they can stay safe when performing gymnastics stunts and supporting the body weight of others. Cheerleaders should aim to strengthen their cores and lower bodies so they can stay grounded and balanced throughout their routines, therefore reducing the risk of falls. Additionally, make sure your cheerleader is eating a healthy diet that’s packed with vitamins and protein. They need proper nutrition so they can build muscle, replenish their bodies after tough workouts and stay energized throughout lengthy practices. Let your cheerleader know that he or she should listen closely to what his or her body is saying. For example, if your daughter starts to experience pain in her ankle after landing a stunt or jump, be sure she comes to you before continuing to practice on it. Take her to an urgent care center immediately to get it checked out, as neglecting to address the pain could only exacerbate the issue in the long run. 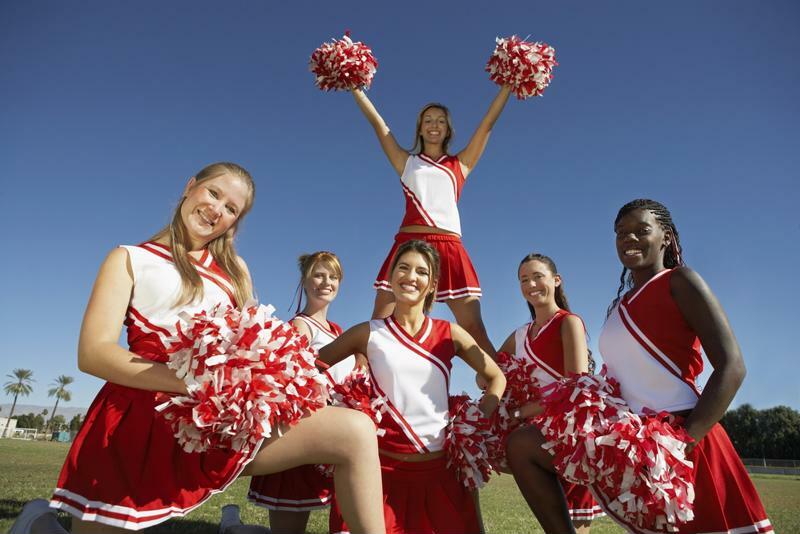 Like any athletes, cheerleaders require the proper uniforms in order to be successful. Make sure your child gets a uniform that lets him or her move comfortably without being too loose. Advise your child to pull her hair back tightly and remove any excess jewelry before practicing or performing. Additionally, make sure your athlete is wearing the proper footwear in the right size. Because cheerleaders rely on their sneakers for traction and support, be vigilant about replacing worn out footwear. Once practices and games have begun, be sure to monitor how your child’s team is doing, both on and off the sidelines. If injuries keep happening, whether they’re minor or serious, consider talking to the coach about scaling back on learning new techniques and suggest shifting the focus to perfecting the basics. Additionally, watch to see how your athlete and his or her friends are faring in terms of exhaustion, and be sure to encourage taking breaks whenever necessary. If your cheerleader does suffer an injury, be sure to keep a close watch on his or her recovery progress. If it’s a fracture or sprain, be sure to let doctors know that your child is an athlete and will therefore need a general recovery timeline. After the suggested healing period is over, bring him or her to an urgent care center to receive a sports physical before you allow him or her to get back into the sport. In the event of a head injury, be even more careful before giving your child the green light to cheer again. Concussions are extremely serious injuries, and sustaining more than one in a short period of time could cause severe damage. If this type of injury occurs, be sure to work closely with your child, the coach and doctors to make sure he or she has healed properly.